It was a tale of 2 halves. In the first half, Indiana finished each of their 4 drives with points, 3 touchdowns and a field goal. The Hoosiers were pass heavy with 26 pass attempts and 5 QB scrambles, including one by Reese Taylor, and just 15 rushes. The 31 pass plays had a 55% success rate and averaged 7.3 years per play compared to a 40% rate and 4.5 yards per play for the rushes. Running backs had just a 30% success rate and a 3.6 yards per attempt average. In the second half, naturally Indiana leaned on their running backs, going to Stevie Scott and Ronnie Walker on 16 of 33 plays. The duo combined for 3.6 yards per attempt and a 31% success rate. The passing game, including 1 scramble by Ramsey averaged 6.9 yards per play and a 47% success rate. It seems clear that there was untapped potential from the IU offense in this one. Had the game been closer, Indiana’s offense likely would have performed better, particularly in the second half. 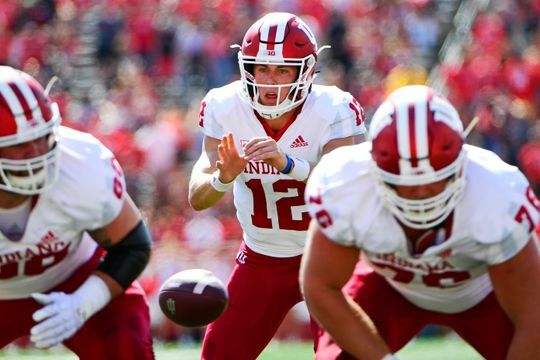 The Hoosiers were opening it up a bit in the first half with 4 passes of 20+ yards including their first play, a 23 yard completion to Nick Westbrook. J-Shun Harris and Ty Fryfogle both had big plays and Westbrook added another one before halftime. In the second half, receivers were only targeted 9 times but tight end Peyton Hendershot had a 22 yard catch and a 25 yard catch. The former was on a behind-the-back circus catch and the latter on an offsides free play. The Hoosiers now have 13 passes of 20+ yards, 78th nationally. Just 1 turnover forced by the IU defense in this one. It came with Rutgers driving late in the first half. Artur Sitkowski, who headed into the game as the NCAA leader in most INTs thrown, tried to get the ball to the tight end but freshman Jamar Johnson was in a great position to make the interception. As far as turnovers forced, that was it for the IU defense. There weren’t even any fumbles forced that IU didn’t recover. Indiana is tied with Alabama[ref]and several others[/ref] for 13th nationally with 10 recovered turnovers. Rutgers had a nearly identical first and second half success rates. The Scarlet Knights managed a 37% success rate in the 1st and a 39% in the 2nd. Their rushing game managed a 45% success rate, bolstered by a 64% second half rate. Their passing game finished with just a 34% rate. The defense wasn’t necessarily the problem in this one. A lot of the reason this game was close was due to the 36% success rate, and two turnovers, from the Indiana offense in the second half. After games with 9, 7, and 10 punts, Rutgers had just 4 punts. Part of this was Rutgers having 3 drives resulting in points scored as well as another that ended in a turnover. Another was the frequency of long drives. The Hoosiers had 5 drives of 10+ plays and Rutgers added 3. Rutgers only had 8 total drives, and 58 total plays, excluding the first half kneel-down drive. The Hoosiers pushed out to a 17 point first half lead, but failed to score in the second half. With 10 second half points, Rutgers cut the lead to 7. Certainly it wasn’t a dominant performance, but Indiana is 4-1. Prior to the season, if someone said that IU would be 4-1 after 5 games, you’d take it. While things likely won’t go well against Ohio State, the Hoosiers are in the driver’s seat for a bowl game.